The Great Game in Cuba uses the backdrop of the Cuban Revolution to examine the CIA's inner workings during the '50s and '60s. 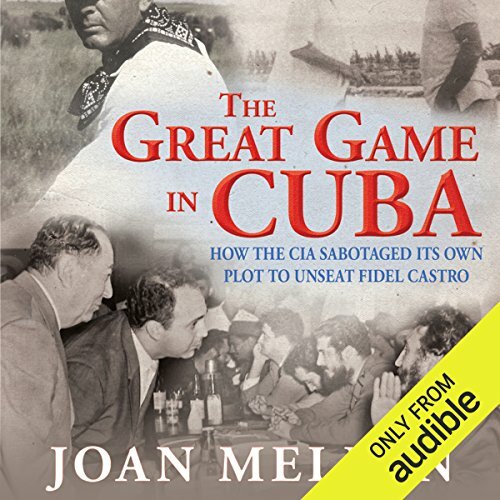 Detailing the agency's lies and deceits, Mellen paints a vivid behind-the-scenes picture of the CIA in Cuba after the Castro revolution: what it wanted and the lengths it was willing to go to in order to paralyze the opposition to Fidel Castro. The game begins with Robert J. Kleberg, Jr., proprietor of the legendary King Ranch, one of the largest ranches in the world. Kleberg's messianic ambitions bring him to Cuba, where he establishes a satellite ranch managed by his right-hand man, the James Bond-type character Michael J. P. Malone, who secretly reports to both the FBI and at least five CIA handlers. From there the plot thickens as an array of Cubans share never-before-revealed information regarding the agency's activities in Cuba and its attempts to unseat Castro and install a CIA-friendly figurehead in his place. The mysterious disappearance of Camilo Cienfuegos, a major figure in Castro's government, is told here for the first time. The agency's shady dealings with a major US publication are uncovered. A testament to the sheer volume of previously classified and untold information, The Great Game in Cuba is a story the world needs to hear. ©2016 Joan Mellen (P)2016 Audible, Inc.